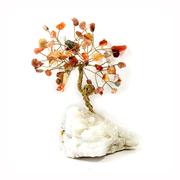 Just like our Tree of Life range, our crystal trees take you back to nature and the inter-connectedness of all life. 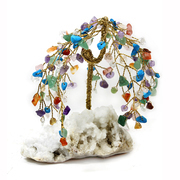 Our crystal gem trees, also known as ‘feng shui’ trees, are original and inspiring ornaments that your can really bring to life in your home. The crystals are mounted on flexible metal branches and rooted in a solid piece of quartz, so they can be shaped by gently bending the branches. It’s wonderfully soothing and relaxing; like having your own crystal bonsai tree that never needs watering! 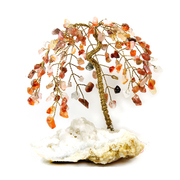 We have four varieties of crystal tree available, Rose Quartz, Amethyst, Mixed Gemstone and Red Agate, with each tree available in 3” or 5” height.